Eurocom has ben able to crack the 3 Terabyte7200rpm barrier in its Mobile Servers and Mobile Workstations thanks to Seagate hard drives that have reduced in size from 12.5 mm to 9.5 mm. Now Eurocom has been able to cram up to 4 hard drives into such models as the EUROCOM D900F Panther, EUROCOM X8100 Leopard and the soon to be released EUROCOM X7200 Panther 2.0. This new piece of technology will increase the already very high processing power, speed and storage space of the Eurocom products. With Eurocom's ability to fit up to four physical hard drives in their high performance mobile workstations in combination with the large storage capacity of the Momentus 3Gb/s 750-GB Hard Drive the total storage capacity in the mobile workstation can get up to 3 Terabyte. The multiple hard drives also allow the usage of RAID 0/1/5/10 which provides both data redundancy and increased disk performance. Amazingly enough no other notebook manufacturer offers mobile products with 3TB of hard drive storage. EUROCOM mobile servers and workstations are designed to replace traditional desktop computers by offering high performance computing in a portable and mobile platform with maximum upgradeability, expandability, and reliability. 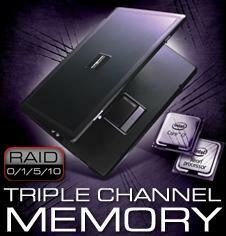 EUROCOM now gives users the ability to use these massive 3TB hard drives for a large array of practical uses such as a Virtualization, workstation-class applications, cloud computing and any other applications that require high end computing power combined with high storage capacity demands and RAID 0/1/5/10 capabilities. Eurocom also offers performance desktop replacement notebooks with 2.25 TB such as the W870CU Cheetah and W880CU Cheetah 2.0. Eurocom offers 1.5TB notebook solutions with the more price sensitive consumer in mind starting with their line of Lightweight Notebooks, which offer long battery life and expansion capabilities.